Kevin Fillmore is a 2003 graduate of Oklahoma State University. He began his insurance career in 2008 as a producer with Liberty Mutual Commercial Markets in Oklahoma City, and in 2009 he was named the territory manager for Liberty Mutual in Oklahoma. In 2013 he joined Rich and Cartmill as an agent focusing on commercial insurance. 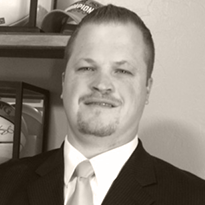 Kevin is a member of the Independent Insurance Agents of Oklahoma and Independent Insurance Agents of Oklahoma City where he currently serves on the Executive Board as Vice Chair. He received his designation of Certified Insurance Counselor in 2017. Kevin resides in Choctaw with his wife and step daughter and attends Life Church. Kevin enjoys many activities including golf, officiating high school basketball, grilling out, landscaping, and spending time with his wife Jenn, step daughter Berkley, and two boxers Max and Penny.